Answering the Questions Your Insurance Company Won't! When you file an insurance claim, you may get conflicting information from your insurance company as to your RIGHTS when seeking out options for the repair of your vehicle. BEFORE you make any decisions, get the answers to your most FAQ right here! Q. Can Tharrington's Auto Works file my insurance claim? A. No. We can be your "Vehicle Accident Advisor", but we cannot file your initial claim. If you are unsure of how to file a claim, we suggest you contact your auto insurance representative for help and guidance in understanding how to file your claim. Click here for more information and tips on how to file an auto insurance claim! Q. Do I have to use the body repair shop my insurance company tells me to use? A. NO! The choice is ALWAYS yours. Even if they suggest a shop in a network of preferred providers, it is always the insured's decision as to where they have the work done, and the insurance company MUST abide by their decision! However, they can insist you to get MORE than one estimate from several places, and will often end up accepting the lowest bid! But you don’t have to accept that bid if you believe the it won’t adequately repair your car. Don’t hesitate to dispute a lower bid if you really believe the adjuster's repair estimate is too low based on what your mechanic has told you, and don't settle for an inferior repair shop to handle repairs they are not equipped to handle. A modern, well equipped repair shop may be able to offer you more peace of mind when dealing with more complicated or extensive repairs. A. The deductible on your policy is the amount you will pay for each accident and is determined by your insurance policy. This will be paid to Tharrington's Auto Works after repairs have been made, and you have inspected your vehicle, and are ready to take it home. Q. Once the insurance company gives me a check, are they "off the hook" for any additional damages found in the repair process? Q. Will my vehicle be "forever compromised" because it's been in an accident? ​​A. NO! On the contrary, most vehicles we repair are brought BACK to their "pre-accident" condition, and some in even BETTER condition than before! That's because ​we use the latest in repair technology and original parts, so that your car is structurally rebuilt to its factory dimensions and tolerances. And with our superior paint and finishing techniques, your vehicle may actually surpass the original finish insofar as corrosion protection and gloss retention. 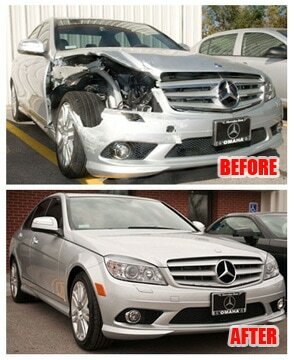 ​Our goal is to bring your car back to the state of perfection that it was before you had the accident.